The "like" button has become so common on social media today that many click it reflexively to acknowledge a post or comment, even when "like" isn't quite what they mean. Recognizing that messages can spark a spectrum of emotions, Slack on Thursday rolled out a new collection of emoji-based "reactions." The new feature comes in part as an answer to a frequent request from users of Slack's popular collaboration software, many of whom wanted a quick, publicly visible way to acknowledge the messages they receive, the company said. 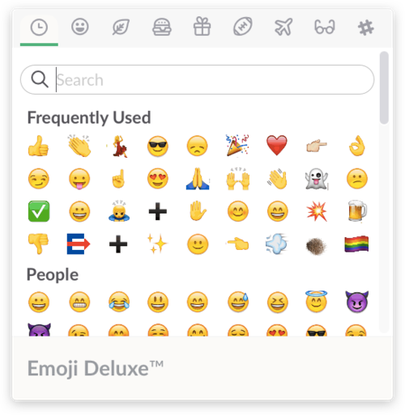 Rather than choosing a single symbol for that purpose, though, Slack tapped its default emoji set to enable a wide array of possibilities. There's the classic thumbs-up or thumbs-down option, of course, but there are also cute animals, hands clapping and a lightning bolt, for example. Alternatively, users can choose celebration icons, a blushing face, a check mark, a plus-one symbol and much more. Teams can also add their own, custom emoji, Slack said. In addition to enabling a wider range of expression, the idea is also to eliminate the need to write another message as a response and allow that sentiment to be conveyed with a simple symbol instead. That, in turn, can cut down on endless, meandering message threads. Slack has also revamped its emoji selector for more logical organization, and it's updated its Recent Mentions tab to include reactions as well. The result is that users can now review in a single place any new reactions that have been added to the messages they've posted. Slack will also alert users to new reactions by changing the @ symbol in the button to the most recent emoji.